Amateur Traveler Episode 503. Today, the Amateur Traveler talks about mountains and mesas, slot canyons and arches, and two of my favorite hikes in the United States as we go to the National Parks of Utah. Welcome to the Amateur Traveler. I’m your host, Chris Christensen. We’ll hear more from our sponsor in a bit but first, let’s talk about National Parks. I’d like to welcome to the Amateur Traveler, Scot and Emily McKay from wingitworldwide.com, who have come to talk to us about some of the parks in Utah. Scot and Emily, welcome to the show. Today’s episode is brought to you by Select Italy. Select Italy designs custom itineraries and books a whole range of products and services including fascinating tours, romantic weddings, or honeymoon trips, along with ticketing services for museums and musical events in Italy. Visit selectitaly.com to learn more. Emily: Thank you. We’re happy to be here. Chris: You pitched me several of the parks in Utah. Utah has an amazing number of parks, especially National Parks. I believe it’s the largest percentage of any of the states in the United States, if I recall correctly. Scot: Yeah, that could very well be true. Emily: Oh yes. Six of them that I can think of off the top of my head. Scot: Well, five National Parks, and then Monument Valley, which everybody kind of thinks of as a National Park which is actually Navajo land. Chris: And not in Utah, in Arizona? Scot: The actual park entrance is in Utah, and most of it actually is in Utah, but it is correct to say that part of it does lie a little farther south in the state of Arizona for sure. Chris: Excellent. Well, what kind of itinerary are you recommending for people who want to explore Utah’s parks? Emily: Well, you can’t do all the parks in one week unfortunately, but there is a couple of options and I went through and kind of broke it down. So depending on what you want to see, and we’ll cover that in the podcast, but I usually would like to do half the parks on one itinerary and if you ever had a chance come back again, you do the other half. There’s Zion, I would start with Zion, and then walk my way up to Bryce, and then on over to Capital Reef. That could be easily done in one week, and then you can do the other half of the parks such as Canyonlands, Arches, visit Moab city and the parks nearby that, and if you have a little extra time, skip on down to Monument Valley. Scot: Right, and on the way down through that southern part of Utah, you can also go to Page, Arizona, where the Antelope Canyons are, which everybody loves to go into. That’s those underground canyons that kind of swirl around that you’ve seen pictures of. 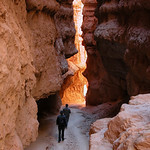 Scot: Yeah, the Slot Canyons and some people like to go also to Lake Powell which is near there, beautiful site. A lot of this straddles the state line between Utah and Arizona. Chris: Right, Bryce and Zion are very close to northern Arizona. For those of you who think this sound familiar, it means you’ve been listening to the show a long time, because we did, long ago, nine years ago or so, I did a road trip to Northern Rim of the Grand Canyon, Bryce, Zion, and Antelope Canyon and there are four episodes way, way back in the archives about that. But I thought it’d been a long enough time that we should readdress Utah’s Parks. You started us in Zion. Strangely enough, I don’t think that many people are familiar with Zion National Park. Want to tell us why we would go to Zion? Scot: Zion, like many of the other parks in Utah, is indeed underrated. Emily: Oh, it’s wonderful. There’s so much to be done, both for those who have trouble walking or have some difficulties, and for those who are extremely adventurous, they have that as well. There’s just a little bit for everybody. Emily: You have the wildlife, the rocks, everything. Chris: Let’s get into details. You mentioned the person who is not as adventurous first. Where are we going to take them? Emily: Well, in Zion, you have several trails that are easy going and that still lets you see the main point of what you want to see. Then there’s the one that we enjoyed absolutely the most because we had children with us, and that’s the Narrows. You take this one mile hike, and it’s a fairly simple hike, and then you get to the end of it and you end up having to walk in the river, and it narrows through a canyon with water. It’s just absolutely spectacular to be in the water, walking through, and you have canyons on both sides, right and left. And it’s so close to you, you can almost touch both sides almost. Scot: The first part of the trail is paved, so even if you’re for whatever reason not able to access some of the less paved or more vertical trails, this is among the easier trails you’re going to find. Chris: I feel like you may even be underselling this. I would say that this hike, and a hike that we’ll talk about when we talk about Bryce, are two of my favorite hikes that I have ever done in the whole U.S. You talk about hiking a river in a canyon. You’re in a Slot Canyon so those walls that you mentioned, you feel like you can touch them on either side. I think it’s what, 20…if you hike up to the Narrows, it’s maybe 25 feet apart at the narrowest spot? Scot: Yeah, it’s fun to hear yourself echo, and everybody else. It’s fun to yell and hear the echoes. Yeah, Emily made it sound like it was a chore, then you have to go through the water. No, it’s a treat. It’s big fun and you’re hiking through the water and there are these little like alcoves on the side where you can climb and sometimes these impromptu waterfalls happen depending on how much rain’s been falling lately or not. And just like all over the place and really every National Park in the country, it’s just really full of surprises. Everything that the park’s known for is just really scratching the surface. You’ve got to keep your eyes open and everywhere you go is something fun and cool and the wildlife can come out anywhere. It’s just fascinating and big fun. Chris: Okay. With the Narrows, I’m going to recommend that if it has been raining, you may not go because whenever you’re hiking a slot canyon, you’ve got the risk of flash floods. So always check with the Rangers before you go. Did you guys go to the outfitters first and do the appropriate Zion Narrows outfit gear? Scot: Well, we do have our water sandals. I would not take your leather shoes off and go barefoot through the rocks because it will be pretty tough on your feet. A lot of companies make them, but if you get the waterproof hiking shoes, some of them have like hard toes on the front. I know KEENs do that. Great shoes to have. I always like to wear the pants that zip off because then if you mess up the lower part, you just unzip and you don’t have to have wet clothes clinging to you. Chris: Well, I also went to one of the local outfitters and you can rent gear. So I rented basically waterproof boots, neoprene socks, a dry bag, and a big walking stick, which is what they recommend for doing that hike. You can also do it as a two-day hike if you want to do it down from the top, and then obviously you’re camping in the middle. That’s a little more adventurous but also the water is going to get kind of deep, especially…you were dragging six kids through there. Well, two of them on this trip. The two teenagers got a little too old for this last trip. They decided they wanted to stay home with their friends. But yeah, we had a three-year-old and a seven-year-old, and they loved it. Chris: At some point, you would get too deep for a three-year-old as you get up to the Narrows. Scot: At some point. It was not drought conditions when we went. It got about two or three feet deep in places, but I couldn’t agree more. You don’t want to go there after a torrential rainstorm or even when they’re predicting rain because you don’t want to get caught. The water just comes rushing down the canyon, that would be that a bad time. The Rangers are usually pretty good about warning you not to do that, unless you get caught in a flash storm. Chris: I have not done that hike but it looks like something you don’t want to do if you have an incredible fear of heights. Chris: The one that I want to do that I didn’t get to do, because I did that all…you talked about doing this in a week, that it’s too much. Well, all of what I did was a week and from California. So yeah, it was constrained in terms of how much time you have. But I’d love to get back to Zion and do the subway hike, which is another slot canyon. If you look for it, well I’ll probably have a picture of it right here if you’re looking at the pictures. It’s an incredible vista where you’re hiking through another slot canyon in Zion. Scot: Yeah, there’s a place called the checkerboard also which is a really neat giant rock formation and the side of this giant rock looks like a checkerboard. It’s really curious and people are always stopping and taking pictures of that. Even if you’re not much of a hiker, you can still get a lot out of this park for sure. Emily: Another thing I really love about that park is the tunnels. It’s going down the main path of going in and out of this park, and they have traffic control, and sometimes it’s one directional if they have big vehicles coming through, but you’re driving through this tunnel and every once in a while, there’s this opening. If you keep your eyes open, you see these beautiful formations including some arches as you’re going through this tunnel, this long tunnel. Chris: Excellent. You were camping as you were doing this. You were doing this in an RV? Scot: Absolutely. We prefer to drag a travel trailer because we like to unhook the truck and drive around. Definitely recommend that if you are pulling a trailer, don’t do it with a low clearance car. These trips aren’t for guys who like to drive Corvettes I don’t think. More like at least a pickup truck or something with reasonable ground clearance. It doesn’t have to be four-by-four, I don’t think, but enough to pull your travel trailer for sure. Chris: Well in Zion, you weren’t able to drive your car I’m assuming, if you were there in the summertime, because you have to come in on the shuttle buses. The main part of Zion basically is restricted to traffic which is nice. If you’ve been to Yosemite in the summertime, you can appreciate that system. Scot: Right. One of the things about the Utah parks is Zion is surprisingly crowded in the summertime. There’s quite a line in the mornings to get into the park at the gate when you come in from the town. Emily: Well, the challenge was the parking. There’s shuttle buses. The schedule is immensely wonderful. They’re very accurate, they’re very punctual, they come so regularly you don’t feel like you’re actually waiting but the problem is the parking. If you get in early or come in after 10 when people start to leave, then you might be able to find some parking but you might spend 30 minutes or an hour trying to find parking, but you won’t be waiting for a bus usually. Scot: Whereas parks like Capital Reef, some people don’t even know that park exists. We went to that park in July and almost had it to ourselves. There was hardly anybody there, and it’s an amazing, beautiful park. So no matter which one of these parks you go to, they’re all going to be incredibly beautiful and have a lot to offer at every level. Some of them are more crowded than others. Chris: Let’s take a break here and hear from our sponsor who is Select Italy. Select Italy is the ultimate source for travel to Italy and offers a wide array of superior Italian travel products and services, including customized itineraries, fascinating tours, romantic wedding or honeymoon trips, unique and fun culinary classes, yacht charters, transportation, hotel reservations, villa bookings, tickets for museums and musical events, and more. Anything and everything you need for optimum travel to Italy is possible with Select Italy. Their helpful travel planners in Chicago, New York, and Shanghai are always ready to give the best advice on when and where to visit, while the Florence support staff is there to help should you need anything while you’re in Italy. Always eager to introduce their clients to great new destinations. The company has expanded its offerings and travel services to the Balkans with the launch of Select Croatia. Visit selectitaly.com and selectcroatia.com. And thanks to select Italy for sponsoring Amateur Traveler. Well, let’s talk about Capital Reef. Scot: The thing about Capital Reef that really strikes me is how it’s kind of got a little bit of what the other four parks have to offer, all in one place, which I think is really neat. We stayed in a little town outside the park called Torrey, T-O-R-R-E-Y. When we got outside to have breakfast, it looked like we were in a Clint Eastwood movie. It was just gorgeous. 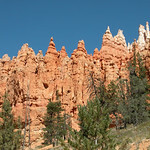 And then when you drive through the park, you see the hoodoos like you would see in Bryce Canyon. Chris: We haven’t talked about Bryce yet, so please tell people what a hoodoo is. Chris: I don’t feel that we’ve given people the idea, first of all, that we’re talking about something made of rock. Scot: Right, exactly. Let’s go there first. Chris: It’s a rock spire. Scot: Yes, basically. It’s a long, vertical rock formation that kind of sticks up out of the ground. Emily: With this bump on the top. Chris: At least at one point had a bump on the top, the bump on the top being a harder limestone than some of the other limestones as I recall. Dolomite is usually at the top of a hoodoo, that has protected this spire of rock from the water which has eroded away the rest of the spire that’s not there anymore. We’ll talk much more about that when we get into Bryce, but I didn’t realize that…so Capital Reef also has hoodoos? Scot: Yes, not quite as many as Bryce. Bryce is just a festival of hoodoos everywhere, which is what it’s most famous for, of course. Emily: Then also they have arches. They have canyons and narrows, and they have a little bit of everything. As you go further down to the very bottom of Capital Reef, you start to see more of a foresty area which you had lots of trees. I guess in the wet season, some little lakes and rivers. It has a little bit of varying of an ecosystem and especially I love the little town, Fruita. It’s in the middle of the park and it’s like a little oasis. It’s this little farm that used to be there and you have fruit trees there, orchards. Emily: It’s green and it’s in the middle of a desert, you wouldn’t expect that. So it’s definitely unique. Scot: Yeah, there are some early American history from some of the Mormon settlements that were in Utah at the time and that’s a neat thing about Capital Reef is there’s actually some history to study there. Plus, there’s lots of petroglyphs from ancient Americans and they’re very easy to find. The kids just loved it because they’re right by the road. Very easy hike again and you can absolutely see them. They’re very clear, lots of fun there too. Emily: And there’s a little scenic area where you have telescopes. You can look up at the cliffs where they’ve done some petroglyphs there as well. Emily: You have a better view of them. Scot: Very kid-friendly park, and when you drive down to the south part of the park, one thing that I think’s worth saying, Chris, is a lot of times, people drive to these parks from all over the country or fly in even from other countries and they kind of stay in the middle of the park and go to everything they’re told to see. But the rewards can be really rich if you’re just going to drive 20, 30 minutes out of the way to another hike that maybe isn’t advertised as much and it is so worth it to explore these parks like you were alluding to earlier. Chris: The specific hike you had in mind as you said that in Capital Reef that we’re really glad we did that extra 20 miles to get to? Emily: We actually took a whole day to go and explore this park. The park is divided into two sections, the north and south. The main road is up on the north end. That’s where the visitor center is. You leave the visitor center heading east, and you leave the park. And right after you leave the park, there’s a road that heads south and that one’s going to take you to the other side of the park, even though you’re outside the park. Scot: That’s Highway 12 right? Emily: That’s actually called Notom-Bullfrog Road. Scot: Okay, it leads the Highway 12 coming back around through Escalante. Emily: Yeah. You’re going to do a circle. You go down this road, and you eventually end up back into the park, but it’s the south part. As you come into the Park, you keep going down, down, down and that’s where you’re going to find a couple of really fascinating hikes. The one that we did was called Surprise Canyons and there was literally nobody there except for us. We had the whole place to ourselves, beautiful wild fun. You’re trying to figure out where the path is. Every once in a while, you’re kind of investigating…oh, there’s the path and you keep on going. You’re climbing rocks, and you’re going through the canyons, and it’s just loads of fun, and you’re really, for the first time, not running into other people, which is refreshing, because with National Parks, there’s always people. Scot: Which is both exciting and unsettling. I mean, if anything happens, you’re out there. Scot: But you have to relax and just enjoy it and make sure you have plenty of water. Chris: You mentioned that the place that was green really stood out and it occurs to me that a lot of people who haven’t been to the southwest and haven’t been there, don’t realize just how barren some of these areas can be, that you can drive for an hour and not see a tree in places or not see another car, depending on which road you’re on. I remember just north of North Rim of the Grand Canyon, not picking up any radio stations, going through the whole dial. You’re really out there in the middle of nowhere, which I love about it, especially a road trip in the area. I think it is a wonderful place for just kind of getting out with your thoughts or with me, with 90 podcasts on your player. Scot: Yeah, you know, 100 miles until the next services. You see that a lot. Chris: Yeah, do fill up. Scot: The one station is always a country station. Or a Mexican station. Scot: It’s like who is listening to this? Yeah, I love that about the Southwest also. I think a lot of times when people haven’t visited the southwestern United States, sure a lot of it isn’t exactly green but I think sometimes people picture like Star Wars with just a big sandy desert like the Sahara, but the vistas are beautiful. Chris: Yeah, I didn’t mean to say it wasn’t beautiful. Exactly. But not Green. Yeah, exactly. We probably need to keep our march on here. We have a lot of places to cover. Anything else we want to say about Capital Reef before we move on? I think we were heading towards Bryce. Scot: The one thing I would say about Capital Reef is it’s very kid-friendly. If you’re taking your children with you, I’d definitely do what the park service calls the Junior Ranger Program, where they fill in this little guide and learn what they can about the park and then they kind of swear them in as a Ranger and give them a badge. And kids love it, especially kids like under the age of 9 or 10. That is a particularly good park for that. They have a learning center and they do really good programs for kids at Capital Reef. Chris: Excellent. We’ve been hinting at Bryce and the official name of the National Park, I believe, is Bryce Canyon National Park. Chris: Which is odd because there is no canyon. Scot: It’s kind of like a pit full of hoodoos. Chris: Well, it’s kind of off to one side. So we mentioned a pit full of hoodoos. Is there perhaps a more poetic way we can say that? Scot: Well, we’re not very good poets, Chris. We’re from Texas and we tell it like it is. I don’t know. What happens is you drive into the park and a great thing about Bryce Canyon is you can sort of drive around the park, drive and get out when you see beautiful views, and enjoy the park. You don’t necessarily have to be a hiker to enjoy it, although you certainly can. There’re beautiful views to be found everywhere, but yeah, it’s kind of along a rim and then the hoodoos are kind of all down in a valley. It’s very different. It’s not like any other place we’ve ever seen, it’s very striking. It’s one of those places like so many where pictures just don’t do it justice. Chris: I believe, in my opinion, it is the most beautiful National Park in the U.S. and that’s saying something because there are a lot of very beautiful National Parks in the United States, but it’s my favorite from that. You’re right. The first time I was there, I was there with my parents and they were not hikers, and so we just drove along and I thoroughly enjoyed it. We were there in April and it snowed. So be aware, you’re at 9,000 feet as I recall. And then I was there the second time when I went to Bryce and Zion in October. I didn’t snow but it was…I think it got down to 20 degrees. I think they have 100 days a year that it gets down below freezing and then warms up to something warm, which is one of the things that formed the hoodoos, the cracks basically from the ice that was created there. But I remember it being quite warm in the day as you were hiking and then freezing, freezing cold as I was staying in a tent at night. Emily: Oh my. We went in the summertime so we had beautiful weather. Loved it. Wasn’t too hot, wasn’t too cold. The hoodoos remind me when you’re playing with wet sand in the beach and you’re taking the sand and dropping it, it’s making these little formations. That’s kind of what it looks like but thousands of them out there. Chris: Now, you are hikers. 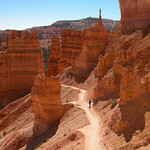 Did you have a favorite hike in Bryce? Scot: Well, when we were actually at Bryce, we had someone with us who had limitations. So we were less of hikers on that trip, but yeah, we sure wanted to. There were lots of places we wanted to climb down. Emily: Yeah. We just enjoyed the scenic views that the park has set up. You can walk up them. Some of them are half a mile or something like that and you have this beautiful overlook where you look down at all the hoodoos and just gorgeous. The park has made it really easy for people with limitations. Chris: I would also recommend, even if you’re not an early riser, sun rise. As the sun rises over the park is just amazing in terms…because everything is very orange to start with. The color of the limestone in the park is already that color and then at sunrise, it’s more so. So if you didn’t have a favorite hike, this is one of the two favorite hikes that I had, and that’s Navajo Trail, where you hike down into the hoodoos. It basically turns into something like a slot canyon also where you’re basically hiking down where spires of rock are on your left and on your right. You need to have mobility but it’s not incredibly strenuous. But it’s a good hike. It’ll give you a good workout, unfortunately it’s on the way back because you’re hiking down into the hoodoos, so it’s the way back when you’re tired so don’t go too far. Wonderful, wonderful hike. I’ll put some pictures in the show notes and put a link to some of my pictures of Bryce. But just one of my favorite hikes and a must-do. If you ever liked to hike at some time in your life, you’ve got to do Navajo Trail and Bryce. Scot: You mentioned the beauty in the morning. I think Canyonlands National Park and Arches are two others that are particularly wonderful in the morning. Chris: Excellent. Well, shall we move on to Canyonlands and Arches or do we have anything else to say about Bryce? Scot: Well, I think we’ve covered Bryce. Scot: Time is short and the state is large. Chris: It is indeed. Where to first? Scot: Well, Emily was saying that a possible itinerary would be to start in Zion, move towards Bryce. We haven’t talked about Monument Valley which is also kind of in between where all these parks are down in southeastern Utah. Another itinerary would be if you’re flying into Salt Lake City especially to drive out to the Moab, Utah area where Arches National Park is right next door and Canyonlands is about a half an hour drive. They’re clustered all together. It’s a great place to hang out for a week right there. Chris: All right. Well, should we do them in that order? Should we do Moab then first? Scot: Sure. Let’s do it all. Chris: Moab, haven’t been, want to go. What can you tell me about Moab? Other than bring my mountain bike. Scot: Yes, Moab is an adventurer’s paradise. Guys who like to drive Jeeps over steep cliffs where they might fall off love the place. Emily: The Lion’s Back, you can watch it. If you’re fortunate enough to be there when someone’s driving down there, that would be amazing. Scot: Did you say unfortunate or fortunate? Scot: I’m not sure which it is. I heard you say drive Jeeps off of cliffs and that seemed like a very bad idea to me. Chris: This is like over a hump and we’re talking a hump, it’s probably 10 stories high. That’s a sheer drop off on the other side and it’s one lane wide and these guys are driving on it. Mountain bikes, it’s like driving on the surface of the moon with a mountain bike. It’s like almost having a natural cement rolling surface that you’re riding. Big fun. Chris: It’s kind of a natural skateboard park is what it looks like to me with some of the pictures. Scot: That’s exactly what it’s like and you know, you can make it as easy or as challenging on yourself as you like, depending on your skill, which is neat because like you said, it’s natural. It’s just stunning that you can do that. The town itself, there’s lots of little shops. It’s one of those typical southwestern towns where, you know, you can find anything to do after a long day of hiking. It’s a very red, rocky place all around, which makes it startling and striking. The views are beautiful everywhere around it. Emily: Yeah. For those who come in from out of town who don’t have a bike or don’t have a four wheel that they’d like to be able to use on these really cool places to venture out in, Moab is an excellent place for that because they got rentals everywhere. That’s not going to be a problem. Chris: Excellent. Anything else we want to say about Moab? I’m feeling the time pressure here. We have so much to cover. Scot: Well, I’ll tell you, Arches and Canyonlands are probably my two favorite parks in the whole state. Chris: Okay. Let’s talk about Arches then. Arches sort of gives away the key phrase right there in the name of the park, I think. Scot: Right. But you know, ironically, even though it’s called Arches, you’re still utterly amazed by how many arches there are. Sometimes you asked your guest, Chris, what the most surprising part about their trip is. Believe it or not, it’s the sheer number of arches in Arches. Emily: Well, for me, it’s not just the sheer numbers but the fact that the way that they’re shaped isn’t always the way you envision them. Like there’s one that’s like a triangular one. It doesn’t follow the way you normally would envision an arch. It looks like someone put a toy out there and it’s an empty dome in the middle with arches all around it. Scot: Yeah. And then there’s one called Double Arch that’s almost like two arches built into one, which seems almost impossible to think. There’s one called The Skyline Arch, which is a very long arc, like a football field long. And it’s a great hike out to it, especially with kids because it’s not too long, still feels like an adventure. And then, of course, the iconic one is the Delicate Arch which is actually on the Utah license plate. It’s kind of a hike to get to it, but even if you have folks who aren’t into a long hike, there’s still a vantage point from which you can see it very well. But man, Arches has arches everywhere. You can’t believe it. It looks very much like a Wile E Coyote cartoon. It is absolutely the inspiration for, you know, the Road Runner cartoons. And lots of short hikes, all of which are rewarded with something really cool at the end and that’s what makes it a really, really, really cool park to me. Also, it’s very red, like you were talking about the red rocks. Everything is just very iron rich or something there because everything’s red. Chris: Interesting. I recall, we haven’t talked about geography that much. For me, the Capital Reef Visitor Center had one of the greatest introductions into the whole geology of the area in terms of sandstone versus limestone for instance. Arches would be, again, these limestone structures and Moab, when we talked about that natural skateboard park, would be sandstone because all of basically Utah used to be ocean. This is all left over from dunes or from natural sea creatures that turned in…later on into arches and things. It is fascinating geological history of this area as well. Scot: Emily and I were talking about that, Chris, and it’s like, you can see it underwater almost. When you think about that, it’s just an overwhelming thought that you’re standing in this underground seascape from millions of years ago that’s now a desert and so beautiful. Chris: Excellent. Then we would from Arches to Canyonlands. Scot: Canyonlands is again, one of those underrated parks. Emily: Oh absolutely. I didn’t even know Canyonlands existed until we were visiting Arches and I’m like, “Whoa, what’s this park about? And it’s just pretty much just right across the street from it, it seems. Scot: By the main road. Emily: Right, but when you’re traveling thousands of miles, it feels like it’s across the street. We go over there and visit the visitor center and there’s a few little hikes there, not a whole lot. But they’re simple and easy to do and there’s a couple of them that strikes us as amazing. One of them is the arch that you get to walk across. Scot: Yes, that’s Mesa Arch. This is one of those deals about the Utah National Parks. Whenever you see like an old western movie, Monument Valley notwithstanding. They like to use Monument Valley in the old movies. Any time you see a Western vista that you just don’t know where it is but wow, that’s amazing. I wish they’d tell me where that is, it’s almost always somewhere in southern Utah. We’ve seen like credit card commercials where some gal’s hiking to the top of a point somewhere and we went, “Oh, that’s Canyonlands National Park.” We see this Mesa Arch that Emily’s talking about a lot, usually right at sunrise because the sun casts this beautiful red glow underneath it and people like to photograph it early in the morning. But to me, the most amazing feature of the Mesa Arch is you can walk across the top of it. It’s a sheer drop of at least 1,000 feet on either side. It’s about eight feet wide and you can walk over this and it’s really just an amazing adrenaline rush to walk across. Chris: I think I may have to say you could walk across. Emily: If you’re afraid of heights, it’s going to look more like it’s two inches wide. Scot: Well, for better or worse, we had it all on video, so whatever happened was going to happen. But yeah, that’s a very short hike, less than a quarter mile to it, if that. Chris: I’m feeling, in terms of hikes, I didn’t pin you down. Backing up just a little bit, in Arches, you mentioned a couple great hikes but I didn’t ask for the name of them. Scot: The Skyline Arch, like we said, the one to that very long arch is a wonderful one. I think if you have the moxie to do a couple three, four-mile hike in each direction, do the Delicate Arch hike. Everyone who’s done it says it’s wonderful, and a lot of short hikes there. The Ranger-led hikes are a lot of fun for children too because they allow the kids to climb all over everything and kind of point out places where they can climb and look, so don’t sleep on that either. Chris: Well, we’ve given a couple nods to the Rangers. This being an anniversary year for the National Park system, I have great respect for the Rangers in all the parks that I’ve been to and they really do help make it a wonderful experience. My thanks to the many National Park Rangers out there, I know some of which listen to the show. Scot: The centennial for the National Park Service so they’re running a lot of special celebratory things this year. Chris: Uh huh, right. America’s best idea, I think is what some people have been calling it and I think that’s a great way to call the National Park System. Excellent. Canyonlands, Arches, anything else we want to cover in those two? Scot: Canyonlands, one of my favorite National Park experiences of all time was driving what they called a Shafer Trail. Scot: I was the one who had the white knuckle driving experience. Chris, you get on this trail and you’re looking at basically America’s version of the Yungas Road in Bolivia, the road of death. I mean, it is a sheer drop, like a mile down. One thing we need to say about Canyonlands is if there wasn’t a Grand Canyon, this place would world famous. It’s the younger brother to the Grand Canyon but not by much. It is, again, one of the great surprises of this trip is just how amazing Canyonlands really is. This is the road that, at the bottom of it, is where they filmed the infamous last scene of Thelma and Louise where they drive over the cliff in their T-bird. This is on this road we’re talking about. It’s on the more tame part where they filmed it. It starts off easy enough. Okay, we got this cool little dirt trail we’re going drive down. Scot: One lane but it’s two way. Again, like the road to death. And you drive this thing and it becomes a cliff. I mean, you’re on the top of this canyon. I mean, you know, should have known. You know where the road’s going, there’s only one way to get there. We’re hugging the cliff on the way down and there are these 90 degree switchbacks that if your brakes fail, you’re done. My family, my daughter, my son are going, “Oh, Dad, look at the bird and look at these rocks, aren’t they beautiful?” And they’re trusting me implicitly, and here we are, driving like two miles an hour down this road and I’m just hoping and praying the car holds together. Emily: One hundred and eighty degrees in some areas. Scot: Right. One or after the next 180 degree switchbacks. You have to drive around the turn and then it’s just oblivion on the other side. So we get down there and then once you get down to the bottom, you have this sigh of relief. I make it sound like it’s this horrible thing, it’s actually big adrenaline-inducing fun. You get down to the bottom, you still have to watch where you’re going because there was one point where if we would’ve driven down the trail, we would’ve just driven off like a 20 foot cliff. It was part of the trail. So we had to get out and look and eyeball and say wait a minute, where’s this going, then drive around it. Emily: Yeah well, there’s those rocks in the way. We’re like, “Where did our trail go? We can’t like…it has to go somewhere.” You step out of your car and investigate. “Oh, there it is, it’s over there.” It felt like a huge adventure. Scot: I would recommend going the other way. I would recommend starting in Moab, going up what they call the Potash Road where they have potash mines and it’s actually privately held land for a while. Then going up the flats, going along the more tame side of the canyon, and then driving up that last part instead of depending on your brakes to keep you on the way down. That would probably be the more sane way to do it. Emily: Was that road number 279? Scot: Yes, just outside Moab. Catch that and it’ll take you right to it. It’s a longer way to get from where Arches is. It’s right next to the gates of Arches really because Arches is right in Moab. It’s like a mile outside of town. Emily: Now, to go from 279 into the park doesn’t take very long. To go down this Shafer Trail all the way through all that stuff and on out the other end, it’s like three hours. So be sure to take snacks and some water. Be prepared for anything that might happen while you’re there. Scot: And again, this is one of those things that not everybody does. So when you get down to the bottom part, when you’re actually in the canyon, it’s going to be very warm and there’s going to be nobody there. There is a possibility you might get a flat or something so make sure you have a spare tire, and make sure you have plenty of water. Chris: Excellent. I’m going to have to apologize. I actually confused two parks earlier. I don’t know if you noticed it, but somebody has been yelling at their iPhone when I was doing it, I’m sure. When we were talking about Capital Reef, I talked about it being so large and I also mentioned going to the visitor center in Capital Reef is where I learned about some of the geology of the area. I was conflating Capital Reef with the other National Park we didn’t talk about in that area which is Grand Staircase–Escalante National Monument, which is large and you really need an off-road vehicle to get into. So everything that I said about Capital Reef, ignore because I was talking about a different park. Scot: It is a good visitor center there though. Emily: You know, Chris, you’re right about the different formations in the rock, geology, and all of that of the place. Because when we’re at the center, especially the children’s learning center, they have a whole display about the formations in the rock and everything going on with the geology there. So yeah, they have it there as well. But what’s interesting, I was saying earlier when we were coming down that long trail going to the south part of Capital Reef, you go across Capital Reef which is the little tiny narrow part of the Capital Reef and all of a sudden, you’re in this Grand Staircase–Escalante. You get to drive through that, and it’s paved. I don’t even have to have a four-by-four there in that particular area. Magnificent because there’s huge trees like you’re in a forest and every once in a while, you come to a scenic area where you get to overlook the beautiful boulders in the canyons and stuff that you just got through driving through. Scot: A nice exciting drive up the ridge on the way over there too, and then lots of geography changes, which is always fun. Cattle in the road you’ve got to watch out for. That’s the loop that takes you back to tour Utah. Capital Reef, another thing about them is they claim to have the cleanest air in the United States which makes for wonderful stargazing. Chris: Well, of course, you’re also higher up in a lot of these parks. Do bring sunscreen for that reason too. Excellent. We’ve been teasing you with Monument Valley. I want to just mention it briefly before we start wrapping this up just because I know you want to. We’re on the border here between Utah and Arizona and we’re in a John Ford Western movie. Scot: Yes, absolutely. If you’re a big fan of Western movies, you will immediately recognize Monument Valley. It’s just a striking place to be, and there’s places where they show you it was John Wayne’s favorite place to stand and they have a place you can drive to where now Native Americans are selling their wares and you can get flatbread tacos and stuff like that. Still, it’s not very obtrusive, it’s a neat little place called John Ford’s Point. When you drive down in there, you get to it. Emily: It’s interesting, they advertise that you need a four-by-four, otherwise don’t dare try going down that road to that viewpoint. The reality is, we went. You don’t need a four-by-four. You do you probably or should have a high clearance vehicle but we saw a little minivan go down there with no trouble. We’d been there at least twice before and we didn’t go down there because we were told you have to have a four-by-four. If not, go on one of the tours that they offer. It’s, you know, however many dollars does it cost, that you can actually go on it and actually see it. But we didn’t. This time, we did and we’re glad we did. You don’t need a four-by-four and you don’t have to go on the tour. Scot: The interesting thing about some of these places is how few people had visited them in the past compared to nowadays. When you go watch the old movies like The Searchers with John Wayne, they’re showing Monument Valley at the very beginning of it. It says like Texas 1863, but it’s like, “That’s not Texas.” But it’s always a kick to see that. Chris: Excellent. For people who want to hear more, because we’re obviously going to run out of time here, we’ve done shows on the region just south, Monument Valley south on the Navajo portion of Arizona. We’ve also covered some of these National Parks in a show that dealt with the four corners area with Eric Smith talking about the different parks, on all four states that border at four corners so that covered some of these parks as well, as well as the shows that I mentioned from way, way back in the way back machine, covering Bryce, Zion, the northern rim of the Grand Canyon, and Antelope Canyon. So we’re going to put off those and we’re going to start to wrap this up. You were standing in the prettiest spot in all of these parks, where are you standing and what are you looking at? Scot: I think, for me, that would be one of the Island in the Sky overlooks at Canyonlands. It really is. Emily: For me, I’d say The Narrows at Zion. I just had a lot of fun playing in that water and just amazed how close I could be to both sides of these beautiful walls that goes straight up into the sky. Scot: Yeah, and of course, the iconic view out to Monument Valley and of course, Bryce Canyon. It’s so hard to pick just one. Scot: Shafer Trail would be one of them but we’ve already kind of flogged that one. The first time we went to Zion, we went along one of the trails, and you can go canyoneering in Zion too. Like these little slot canyons that, you know, make Antelope Canyon jealous they’re so narrow. We happened across a little puddle of water and there was a small snake actually drinking from the water. It wasn’t a poisonous snake it was…I can identify these things so I walked my young son up to it who was probably three at the time and I said, “Look, look, son. There’s a snake drinking.” He was fascinated and we were keeping our distance, of course. That snake turned around and reared up and hissed. I think its neck turned into a hood. It was almost like watching this little demure thing just turn into a monster right before our very eyes. I even jumped back, and my son just whooped and screamed. And then a minute later, he was walking back up to it. He’s like, “Let’s do it again.” He’s like, “Again, again.” I was like you know only in the southwest. That was one of my funny moments that I smile about. Chris: Excellent. And last two questions. Finish the sentence, you really know you’re in…I’m going to call it Southeastern Utah because that’s really where we’ve been, when what? Scot: I think you really know you’re in Southeastern Utah when you get behind the wheel and there’s never a bit of dull scenery. Every mile you drive, there’s something beautiful, new, and amazing and it seems like it changes every 10 miles. Emily: For me, it’s when you’re going along the land and all you see is rainbow colors. The rocks are nothing but full of colors: white, blue, green, red. It’s just amazing how it’s just like a rainbow of colors everywhere. Scot: That’s interesting because I remember it largely being brown to red. Chris: You’re driving somewhere different than I am. Where are you driving? Emily: Escalante has a lot of the blue and white rock. Moab has a lot of the white rock. Bryce had a lot of rainbow colors but they’re more in the red and white tones. But yes, it feels like a rainbow to me. Chris: Excellent. Our guests, again, have been Scot and Emily McKay and I will let you say it this time. Where can people read about your travels? Scot: Well, we have a brand new blog called wingitworldwide.com, and we have lots of blogs, and we’ve put some effort into our writing, so I think you’ll enjoy it. We do have a blog up there about Canyonlands that has videos of everything we’re talking about, including the Mesa Arch, and we just launched a podcast of the same name which is wingitworldwide.com where we cover a destination every week and basically rant about it and have lots of fun with it. So we hope you listen to that too. Love to hear from you too, by the way. Chris: Excellent. You have also been doing, I understand, for 10 years, another podcast about dating advice. In case people are looking for that, where can they find that? Scot: Yeah, well we have two of those over in the sexuality section on iTunes. One of them is Called X & Y on the Fly, that Emily and I host together and the other one is called the Chick Whisperer, which a woman actually named. I do not call myself the chick whisperer, the show’s called the Chick Whisperer, which is just wildly popular. We have lots of guests. That one’s mostly for guys who are looking to get better with women. But I think it’s worth saying that our lifestyle as working on the Internet has allowed us to do a lot of travelling and work from anywhere in the world, which is why we’re so passionate about the travel blog and the podcast. Chris: Excellent. Well, thanks so much for coming on the Amateur Traveler and sharing with us your love for Utah and some of the spectacular scenery there. Emily: Well, thank you, Chris. We’ve had a lot of fun talking about Utah. It was great. Scot: We’re big fans of the show and have been for a long time, so it’s really an honor. Thank you. Chris: Oh, thanks so much. I did suggest to Will that just playing the podcast for his son might put him right to sleep so that’s a something to think about as well. Elinor left a comment on the episode we did recently on Seattle and said, “This episode recommends taking a roundtrip voyage on the Bainbridge or Bremerton ferries and not getting out at the other side. The Washington State Ferries now requires all passengers to get off the ferry at both ends of the trip. You could just get off and walk back on, but Bainbridge Island in particular, rewards a few hours of exploration, even on foot. There’s a nice, little, and free art museum and some good places to eat especially Mora Iced Creamery and Hitchcock Deli.” Elinor, thanks so much for letting us know. Sam said, “Mary Jo offered a list of suggestions in the podcast. Though there are a few additional activities I’d recommend as well. First, I have to agree with Elinor here. Bainbridge is a lovely place for tourists to visit with great bakeries and restaurants all of which are within walking distance of the ferry. If you bring a car over, you can visit the Bloedel Reserve, a very pretty garden with lovely views of the Puget Sound that’s great for family outings. The University of Washington campus is a pleasant place to walk around and enjoy a couple of hours. Springtime is the best season to visit when the cherry blossoms are out. As of next month, March 2016, the UW will also be accessible from downtown Seattle via light rail. Another activity not to be missed if you’re a sports fan is attending a professional soccer game for the local Seattle Sounders. Seattleites love their team, The Sounders routinely attract over 40,000 fans to their games, and it feels very much like going to a European match. Finally, Green Lake and the attached Woodland Park are a great family destination, and an easy bus or cab ride from downtown. The lake is lovely to walk around and Woodland Park is where the zoo in Seattle is located, which is worth a visit if you have more time to spend in the city.” Thanks, Sam. If you want a last-minute trip to Cambodia, there’s still a few slots open in that trip that’s coming up here at the first part of April. With that, let’s end this episode of the Amateur Traveler. If you have any questions, send an email to host at amateurtraveler.com or better yet, do with both Sam and Elinor did and leave a comment on this episode at amateurtraveler.com. As always, thanks so much for listening.